I first heard of roller derby in about 2009. I was living in London and my flatmate knew someone who played for London Rockin Rollers. I remember her describing a bout to me… it sounded like the craziest thing ever. 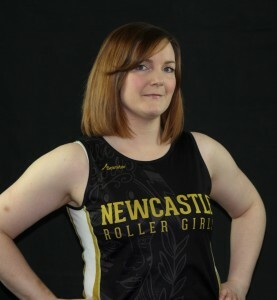 It wasn’t until 2012, just after I’d moved to Newcastle, that I actually watched my first bout. I went along to see my friend Anita B Nasty play with NRG. It took me the entire game (and a quick scan of the rules at half time) to figure out what was going on. It still seemed like the craziest thing ever but I was hooked and wanted to play! I joined NRG’s Fresh Meat course just a few months later and so began my roller derby adventure. I’ve learned so much from both the game and being part of the league, I could probably write an essay response to this question, so I’ll stick to the most important thing I’ve learned instead – A shared goal is an incredibly powerful thing. VRDL All Stars. I love their style of play, their teamwork on track and the precision with which they execute their game. I like to lift heavy things up and put them back down.